Nowadays, print ads are not enough to promote your hotel to prospective guests or visitors. Remember that most people these days are searching for new travel destinations and hotel accommodation online. Thus, hoteliers should not ignore the importance of using a hotel website in attracting guests. A website can certainly help you promote your business and let your potential guests take a glimpse of the amenities and services that you offer. Make sure that your website is not only eye-catching but it should be functional as well. 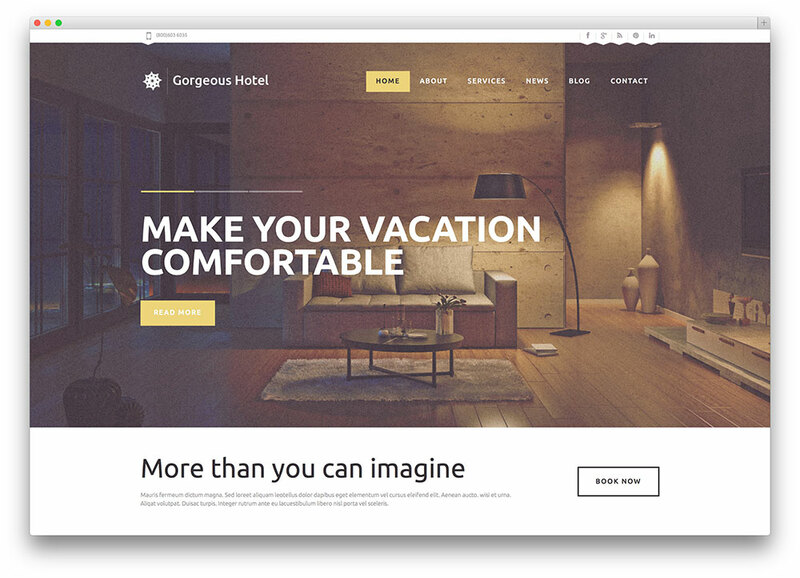 If you want to build a professional website for your hotel with no trouble at all, you might consider getting a premium WordPress theme. These hotel WordPress themes are designed to help you show the beauty of your location, showcase your rooms, present the facilities and features of your hotel and offer an easy method to book a room. Bellevue is an innovative Hotel and Bed and Breakfast theme for WordPress sites. Its layout is very simplified, and it allows for instant booking. This is a very well-designed product, capable of attracting many users to your page. Bed and Breakfast site owners can rejoice, knowing that such a theme exists. Of course, many Bellevue features are niche-specific. For example, you are able to display schedules with availability calendars. Signup is made easier by the pre-made forms, and payment can be processed via buy pages. Nifty online stores can be easily created, thanks to the inclusion of WooCommerce. This is one of WordPress’s most innovative and prolific plugins, as thousands of sites have chosen to use it. Bellevue has 5 gorgeous stylized logos, and 50 Layered Photoshop files. If you do not have the time to start from scratch, you can easily install one of the pre-made demos. There are 7 in total: Hotel, Urban Guest House, Chalet, Beach House, Countryside, One Page, and Lake House. These fully functional layouts can provide the basis for future customization. Site administrators can easily personalize the site’s color scheme, header transparency, widgets and sidebars. A versatile Page Builder tool was also added. For more information, be sure to check out the live theme preview. TheGem is a capable, resourceful and responsive WordPress creative multipurpose high performance website theme. TheGem is an easy to use theme for making all sorts of crafty websites. From businesses to creative agencies, professional portfolios and more, TheGem can handle them all. That’s because TheGem’s collection of creative conceptual demos spans over 50 polished options. You’ll find solutions for your every need within TheGem, complete with inner content pages. Hotels, motels and all hospitality industry websites love TheGem. And it is no wonder. 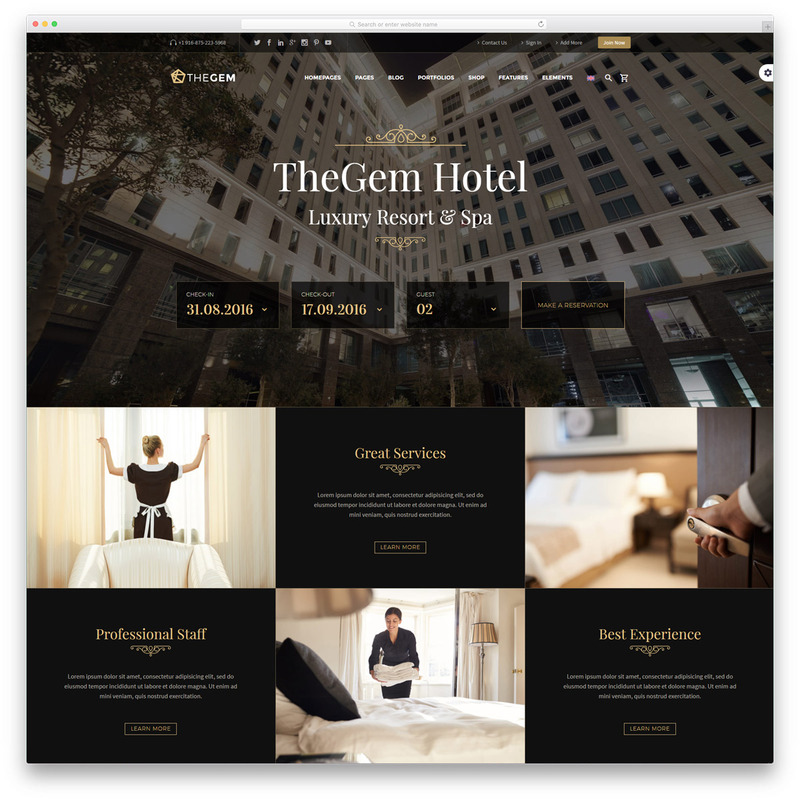 TheGem’s convenient hotel templates come outfitted with everything you need to run your websites. They save you tons of time and effort while offering tons of professional business features. The WooCommerce plugin can power the commercial functionality of your hotel website with ease. Premium sliders keep your content lively and your users engaged. Amazing portfolio and gallery options make your visual content come to life. It’s easy to impress a broad audience of potential customers with TheGem. And with RTL support, you can broaden that audience across language barriers. Unlimited opportunities for creativity await within TheGem. Limitless page layouts and flexible headers and footers make for unique pages. Install TheGem today, and take your hotel to the next level! This is a classy, well designed and user friendly WordPress hotel booking theme. 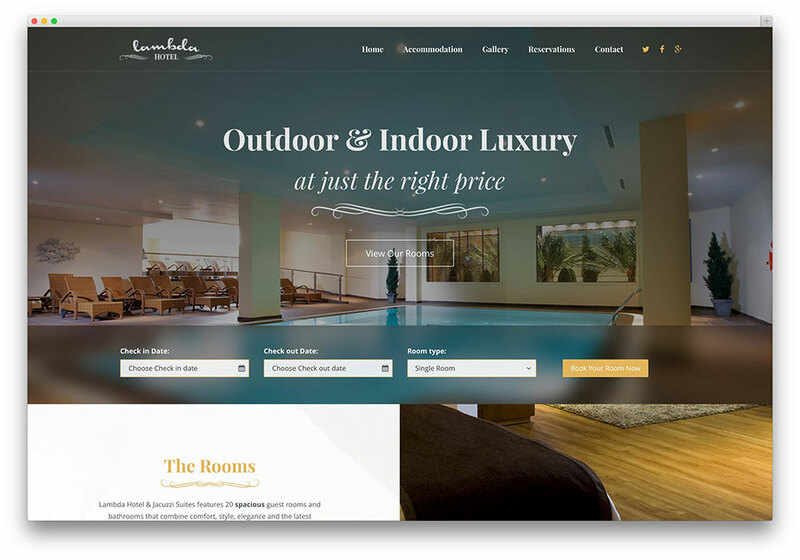 Lambda is without a doubt, the ideal choice for those that wish to have a professional hotel website. It has so many options, that it barely feels like one theme. The developers have added some useful demos on the theme website. They cost nothing, and customers can sample the content before deciding to buy anything. Each demo presents a unique style, and seems to focus on a specific niche. The One Click Demo Installer does what its name suggests: it requires only one click to initiate the otherwise complicated installation process. There are over 100 awesome Bootstrap options. This means that almost all elements on your website can be changed, tweaked or altered. With so many variables in play, no two sites will be alike. Building interesting pages has been simplified, thanks to the Visual Composer Plugin. Lambda is a very accessible product, as each feature seems designed to maximize customer convenience and comfort. If you do decide to buy this theme, you will automatically receive a lifetime of free support. If any issue emerges, do not hesitate to contact the support team for advice. The theme download incorporates the impressive Revolution Slider, allowing for the creation of awesome slides. Slides are very efficient methods of displaying content for the user, highlighting important images. Lambda is made to adapt to any device, assuring that it looks cool on both desktop and mobile screens. You may also influence the navigation on your site, thanks to the 6 distinct header options. 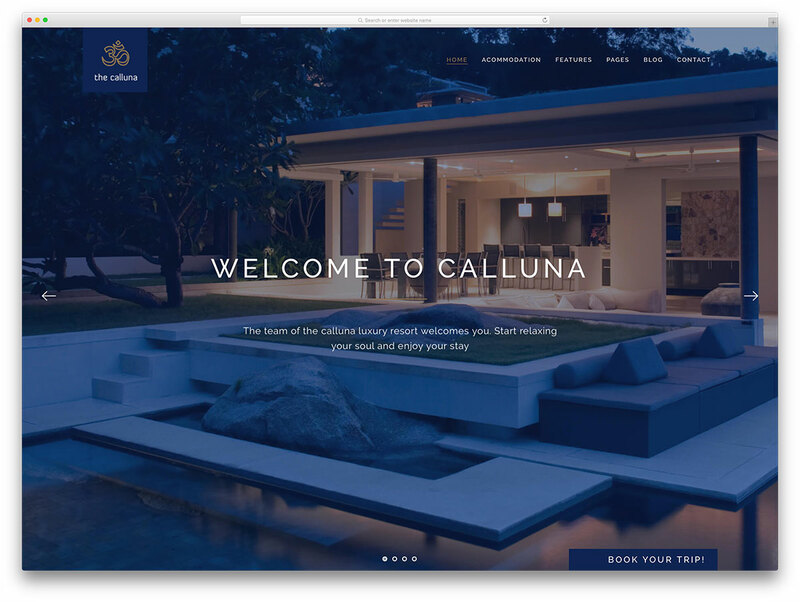 For your Hotel website,Calluna is an ideal choice. This modern WordPress theme exceeds all expectations. Its design is charming and welcoming, and the layout is completely responsive. Indeed, your posts and offers can be viewed on the screens of laptops, tablets, smartphones, and desktop computers.Calluna will also work with most major web browsers. 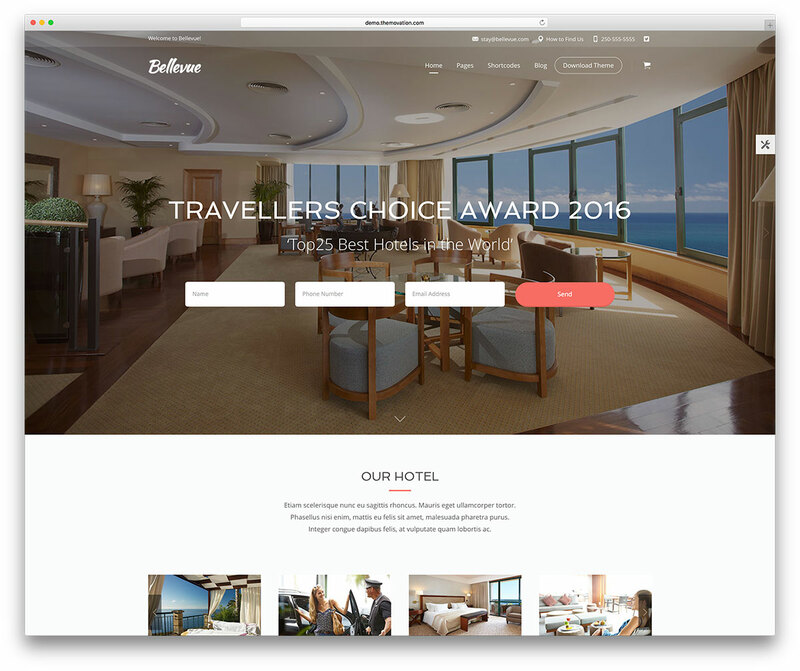 Site owners will benefit from a Booking Overview Function. This useful feature allows you to verify all of the reservations that were made on your site. You can also view their corresponding calendar date.Calluna has 2 main layout variations: Wide and Boxed. You can always change the setting at will, by accessing the Admin Panel. This theme has integrated an exemplary email notification system. You can expect to be notified with every new reservation that is made. Also, it is possible to sort rooms by category in order to facilitate the customer’s browsing experience. Depending on where your venue operates, you can alter the main currency of your page via the theme options. Calluna is WPML-ready, and it can be translated in multiple languages. The administration panel is very powerful, yet it remains user friendly and accessible. You do not have to be an expert web developer, in order to operate your site. Hillter is a modern and attractive theme for WordPress websites. It can be used for a variety of roles, but its main purpose is to improve hotel, villa, or resort websites. There are many useful features, and each feature can improve your site from a practical and aesthetic standpoint. As the site owner, do not hesitate to take advantage of this theme’s beautiful gallery features. You can showcase videos and pictures of your hotel in order to impress potential patrons. Hillter also has a beautiful header with several built-in sliders in the banner area. Of course, Hillter comes equipped with a booking form that allows clients to reserve their rooms. This is made possible by the AweBooking plugin. The theme also incorporates the revolutionary Visual Composer plugin. You will be able to craft a page that perfectly matches your imagination. Just like galleries, sliders can display gorgeous videos and pictures of your building. With the Revolution Slider plugin, site owners can enjoy animation effects, video embedding, image pre-loading, and auto-play functions. Hillter is optimized for search engines, and it increases your chances of getting noticed. SEO-readiness makes it easier for any site to climb those hyper-competitive search rankings. It should also be mentioned that this theme is WPML-ready and fully translatable. 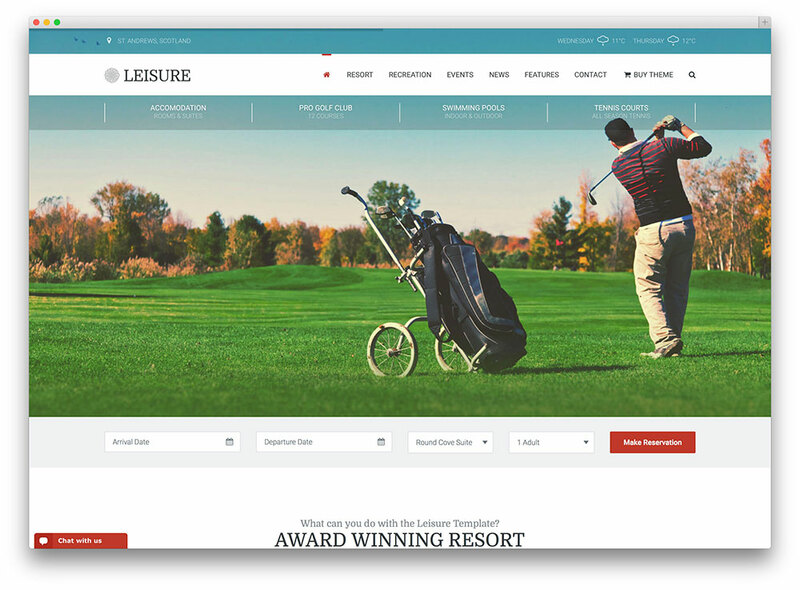 Probably one of the best Resort, Hotel and Spa WordPress themes, Leisure is streamlined to perfection. It is the ideal selection for any website that aims to promote relaxation and restful leisure activities. Be it tennis or soccer centers, golf clubs, holiday and ski resorts, spas and leisure pools, this WordPress theme can show off your great activities. If it is installed, Leisure will make sure that your website will be able to feature multi-level menus, astounding images, and plenty of footer variations. The higher the resolution of the display, the better this theme will look. It is constructed on the acclaimed Leisure Template that has taken Themeforest by storm. It is from the company that managed to create the highest selling racing and fishing theme. In addition, they also produced the top 10 highest selling miscellaneous themes, and the best horse theme of all time. Leisure is an innovator, as it is WordPress’s first Leisure-Purpose theme. It was designed to aid users in constructing visually appealing websites, with minimal time commitment requirements. The aesthetic design of your page will make you stand out, basically guaranteeing that visitors will return for more. All current themes struggle towards a homogenous environment, where multiple platforms meet. Leisure has no issue with displaying content on multiple browsers and devices, facilitating brand awareness and expansion. With this theme, you will be able to create intricate WordPress forms, within a few moments. There are no codes required, all you need to do is use the Drag and Drop Interface. 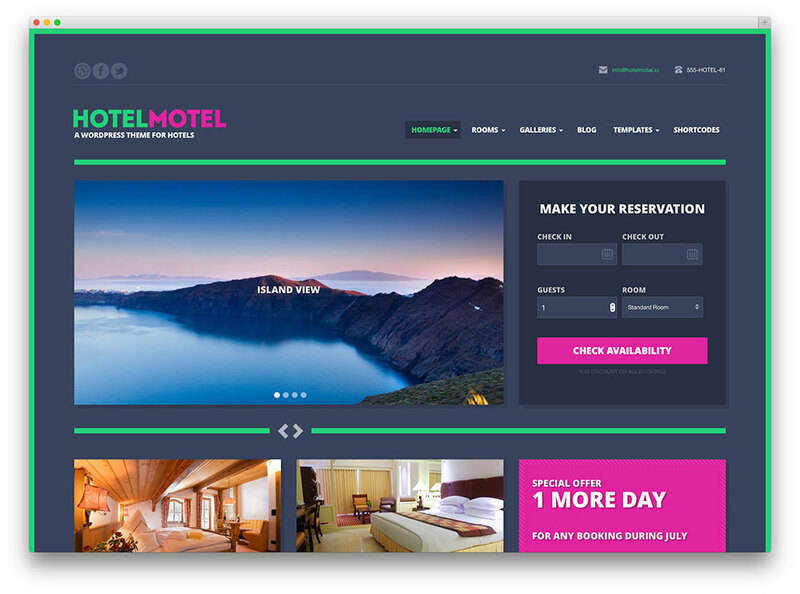 Hotels is a modern and beautiful WordPress theme developed by Template Monster for for hotels, motels, resorts and other kinds of businesses that needs an automated booking system. A lot of people use this theme because of its sleek and beautiful layout that adjusts smoothly on any types of devices. 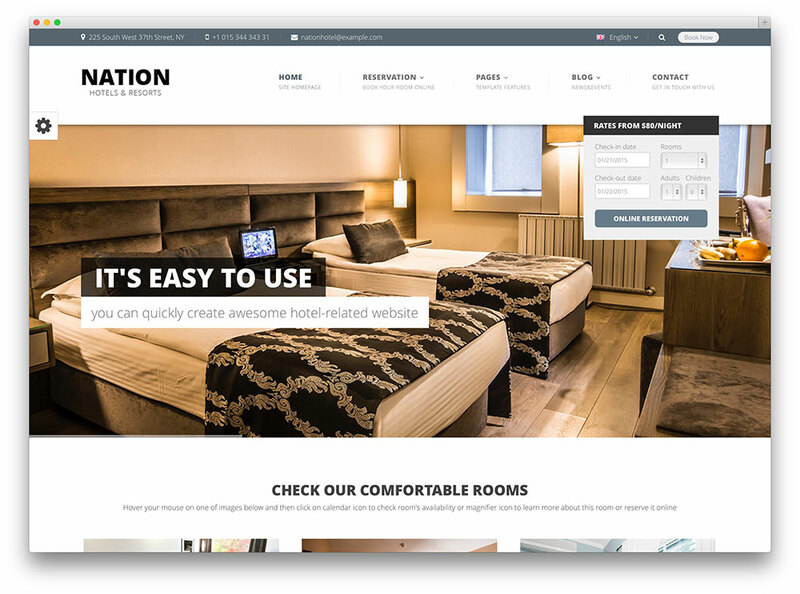 This hotel and reservation WordPress theme is very easy to use install and use. It is fully equipped with tools that you need for styling a theme. Hotels is trouble-free to tweak and personalize to match your brand, thanks to its very intuitive admin panel that is powered by Cherry Framework. You can modify the look and feel this theme by changing the color and font settings. 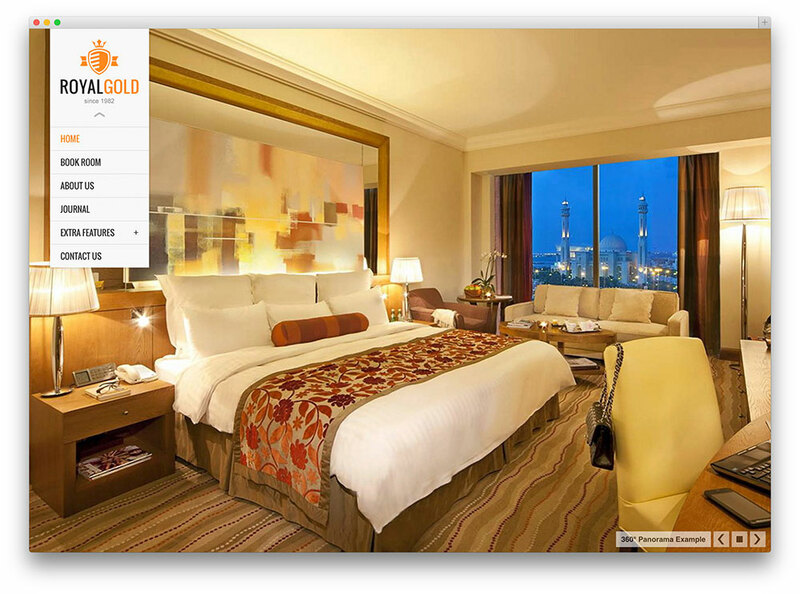 Theme comes with an enormous and fully responsive slider where you can feature images of your hotel or brand. It has a built-in photo gallery that you can use for displaying images of your hotel, rooms and other amenities they could enjoy in your place. This theme also features custom post types for Our Team, Portfolio, Services and Rates, Testimonials and other pages that you will need in promoting your hotel accommodation business. It has custom widgets that you can use for integrating efficient comments system, social sharing and many more. It has theme customizer that offers you a live preview of the changes that you make for your theme. This theme is built using clean code and skillfully optimized for SEO purposes to ensure that you get a significant surge of web traffic. Hotel California is a clean and responsive WordPress hotel, resort and hostel website theme. Hotel California is a perfect solution for hospitality industry businesses and projects. Hotel California’s collection of tools and plugins empowers you to produce polished, resourceful websites. Within minutes of the one click setup you’ll be at the helm of a sophisticated hotel website. Hotel California is easily customized through a visual interface with hundreds of combinations. Powerful and convenient features make your essential business needs an easy matter. Handy shortcodes provide you with dynamic quote calculators and service package presentations. Awesome portfolio showcase capabilities are perfect for showing off your rooms and views. Beautiful and engaging testimonials let your customers speak about their own delightful experiences. 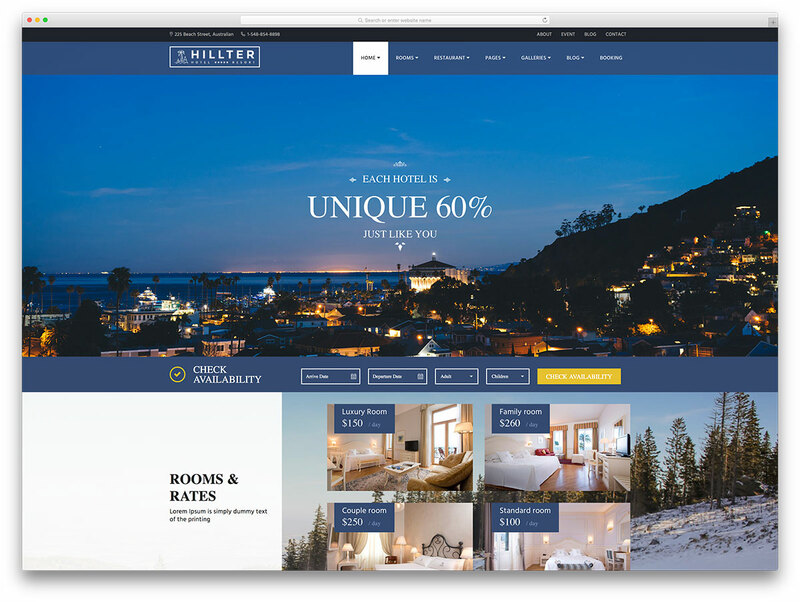 With an intuitive page builder, Hotel California is easy to shape and mold to suit your brand’s needs. Custom typographies and dozens of page transitions are readily available. 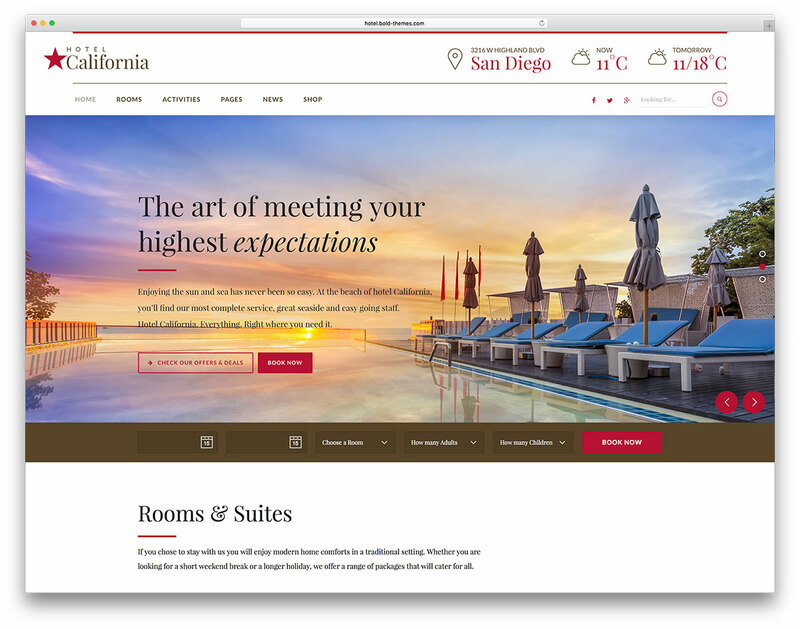 With tons of template pages to deploy with one click, Hotel California is fit for all your needs. A responsive design makes Hotel California exceptionally mobile-friendly. Your website will display just as well on tablets, desktops and mobile phones. All this and more without writing a line of code yourself. Get Hotel California today! KALLYAS is a sleek and streamlined, business friendly and easy to use, modern and tech-savvy, readily responsive WordPress multipurpose website theme. KALLYAS has been equipped with a broad set of powerhouse tools in order to empower webmasters from all fields and industries to furnish themselves with professional quality websites filled with resourceful functionality without ever having to look at a line of code. With KALLYAS, a slew of predesigned demo websites, homepage demos and template pages are readily provided for you to customize at your leisure with the integrated, plugin-free Visual Builder page editor, with over 100 custom elements. Freely build your ideal website with KALLYAS, in a matter of minutes. Travel and hotel booking websites will find in KALLYAS a sound ally and a pliable solution to all their concerns, with helpful templates provided, a seamlessly integrated commercial platform in the form of WooCommerce e-Commerce plugin suite, customizable dynamic Forms and a custom adapted and styled presentation of the MailChimp subscription newsletter email platform to keep your clients and customers readily within reach make KALLYAS well prepared to handle hotel and travel booking. Pricing tables, stunning portfolio styles, multiple gallery and blog presentations and far more choices under the hood round off this solid, resourceful theme. 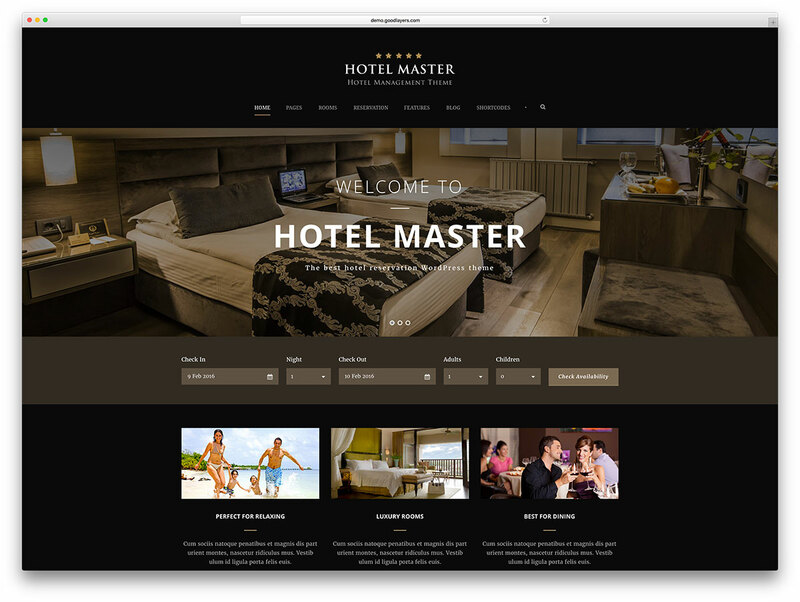 Hotel Master is an excellent WordPress theme for hotel and hostel websites. It allows customers to check out your offers by browsing available rooms, before reservations are made. This product has numerous niche-specific features, and each feature maximizes convenience and accessibility. The layout will adapt to any screen, as it is fully responsive. You will not have to worry about resizing errors. Also, Hotel Master is cross-browser compatible. As the site owner, you can choose between 2 main theme variations: dark and light. Regardless of your choice, the page will look incredible. It is obvious that countless hours went into the development of Hotel Master. Even while booking a certain room, you are able to change your mind by searching for other criteria. No refresh is needed, given the site’s Ajax feature. There is a coupon setting, and you will be able to determine the coupon expiration date, coupon amount, coupon code, and the percentage of discounts. Basically, every element will be under your control. With the latest update, this theme also supports hostel features. Booking will be done by bed, and not by room. If you want to sample any of Hotel Master’s features, be sure to access the theme demo. Restinn is a versatile hotel-booking theme well suited for single branch hotel as well as multi-branch international hotel chain. This theme has everything you would expect from premium WordPress theme that will help you to build awesome hotel, restaurant or other related websites. Restinn theme comes with professional booking system that will help you to automate your most important aspect of your business. The theme features both one page and multi-page setup and new elements on these pages can be added via powerful drag & drop page builder which is included with theme. Other two prominent features include free Premium Plugins (Worth $45) and lifetime support. If you are not sure if Restinn is the right theme for you make sure to check its three demos to get an idea what this theme is capable of. 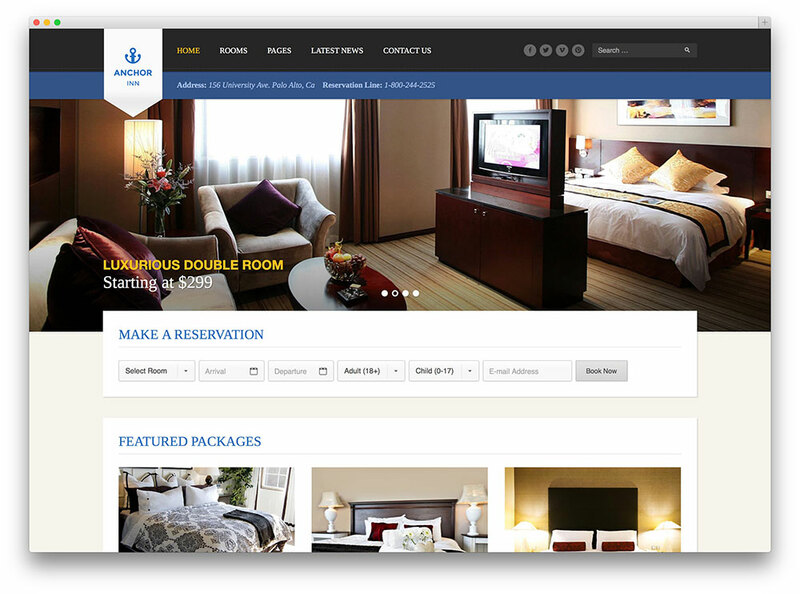 Starhotel is a high-quality WordPress theme that promises to improve your hotel website and expand its capabilities. It has incorporated a series of niche-specific features, and a solid design that it sure to attract many customers. Starhotel has a reservation form that allows clients to book their rooms in advance. The theme is accessible to all customers, even those who lack programming experience. From start to finish, even a child can create a successful site. Page customization is facilitated by drag and drop technology. Organizing elements is very simple, as you only need to drag them across the screen. The layout is responsive, and it can be showcased on any screen. As the site owner, you are able to setup incredible slides that showcase your fine hotel. This is made possible by the popular Revolution Slider plugin, which was added for free. Starhotel is WPML-ready, and it can be translated into any language. Your foreign clients will certainly appreciate the extra effort. It should also be mentioned that this theme has Starhotel alert messages, Starhotel buttons, address cards, box icons, lined headings and testimonials. You can even incorporate Google Maps on your page, helping patrons to locate your venue. For more information, be sure to access the live preview. Flawleshotel is a WordPress theme for those who appreciate quality. Its layout is cozy and charming, designed to attract a large number of potential patrons. 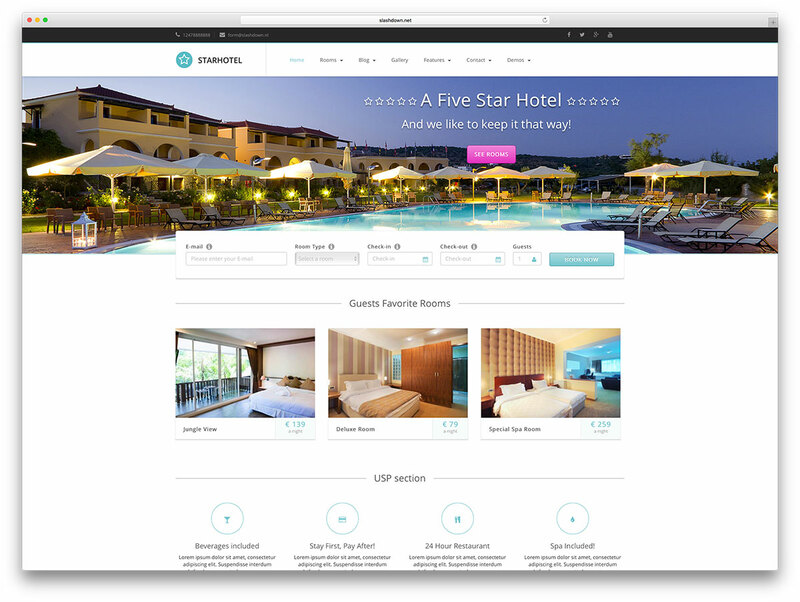 Flawleshotel can be used for any hotel, spa, or resort website. It can be the greatest ally of those who work in the hospitality industry. 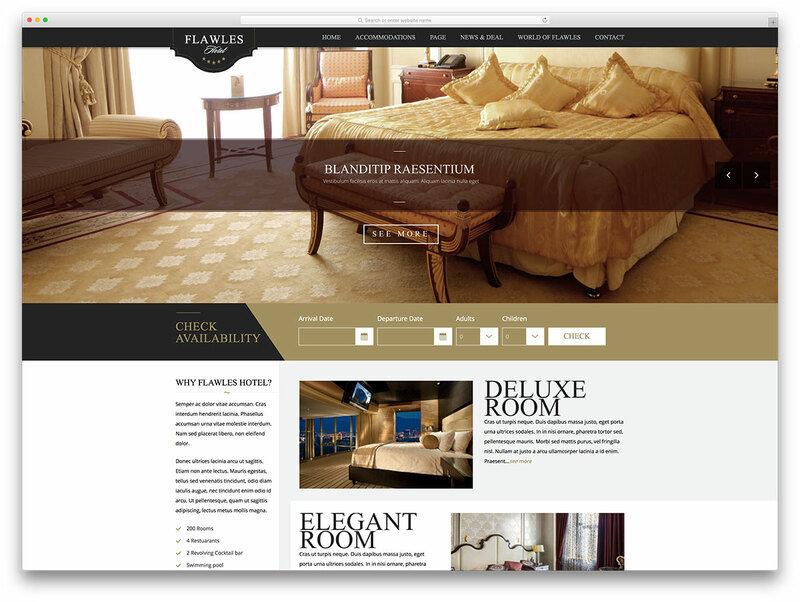 This theme has a system for facility or room management, and built-in accommodation display pages. In addition, it is possible for clients to reserve their rooms via WooCommerce. This plugin can also enable the creation of an online store. Selling souvenirs and memorabilia can be a very profitable venture. Of course, site visitors will want to see pictures of your facilities. Thankfully, Flawleshotel has incorporated the Slider Revolution plugin. With this feature, it is possible to design some awesome slides which showcase high-resolution pictures. In addition, there are stunning animations and transition effects. Thanks to Flawleshotel, your customers will be able to reserve their rooms from their phones. The layout is entirely responsive, and it can be displayed on smartphones and tablets. Cross-browser compatibility is also guaranteed. For a more pleasant site customization experience, you can always choose to implement demo content. Thanks to the One Click Demo Installer, the process can be finalized in a matter of moments. Managing a hotel is hard, and it is even harder to administer a website at the same time. 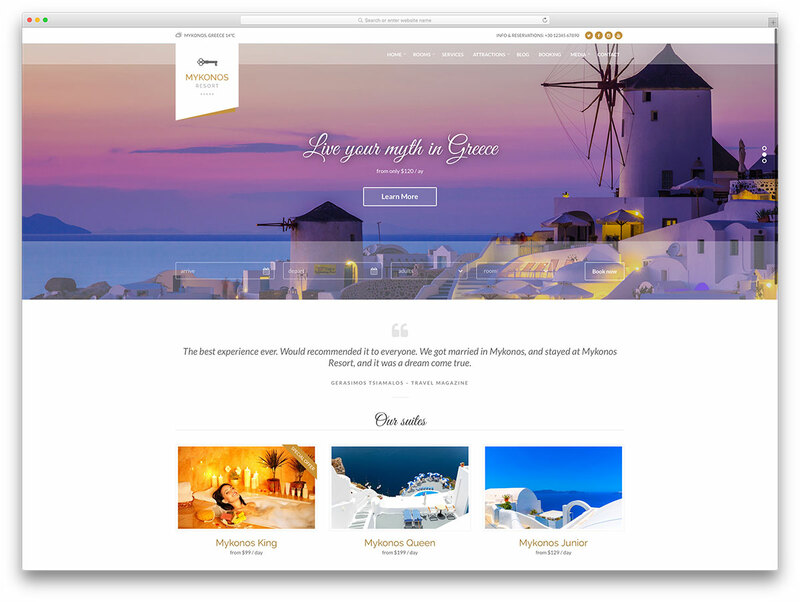 Thankfully, WordPress themes such as Mykonos Resort can offer to lighten that load. This product can enhance every aspect of your hotel or resort page, and it is extremely user-friendly. Mykonos Resort is not satisfied with resting on its laurels. After you install it on your site, you can expect future updates for this theme. With every update, errors will be fixed and new features will be added. In addition, your pages will benefit from a special widget system that makes it easy for users to create a limitless number of drag and drop homepage variations. More than 5000 customers have chosen to purchase Mykonos Resort, and their collective feedback continues to improve the theme. Of course, your hotel website will include a fully-functional booking request form. Processing reservations is made easier by this technology. In total, your pages will include 7 content types, and multiple widget variations. For novice users, a detailed and well-written documentation source was made available. It is very helpful, given that it contains info regarding all features. Should you prefer a more hands-on demonstration, be sure to access the live preview. 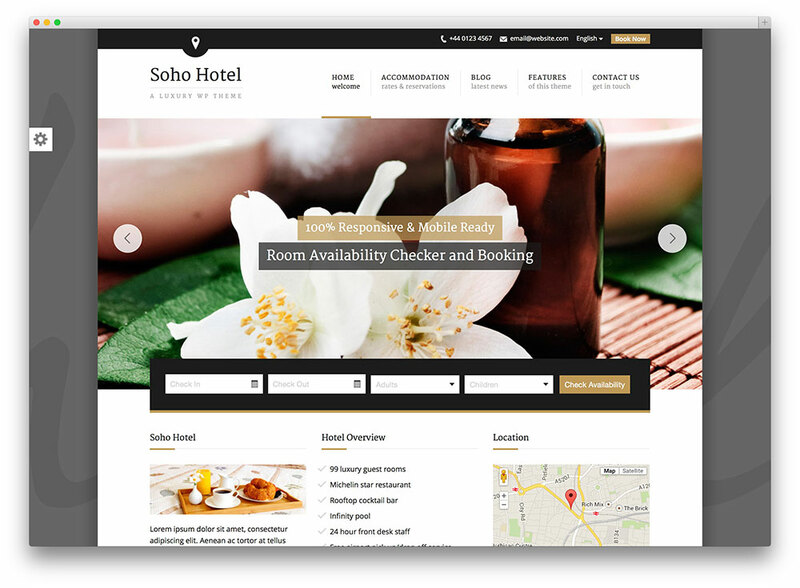 Soho Hotel is a simple yet attractive hotel theme for WordPress which provides the most practical features to manage an accommodation website with ease. 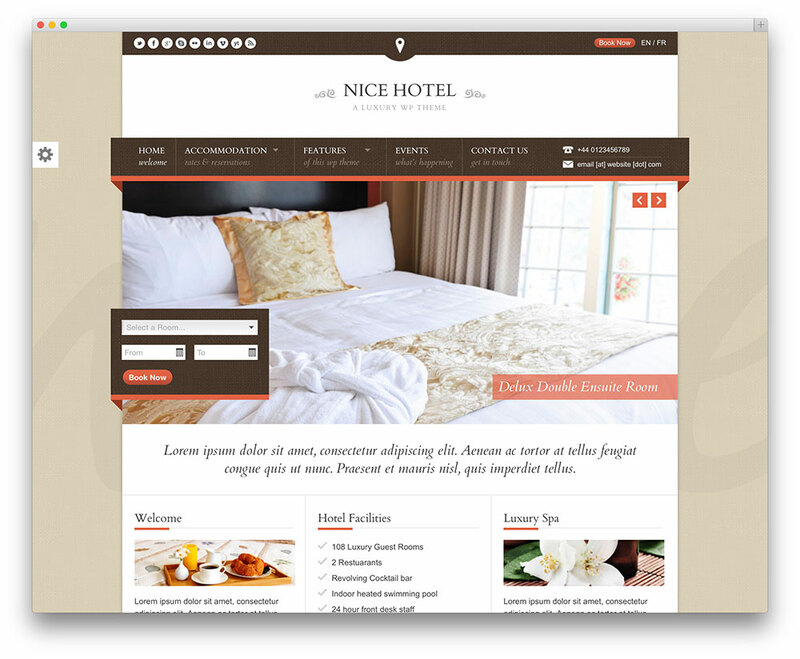 This theme is specifically designed for hotels and travel business. It is overflowing with advanced features and fully customizable booking form. It has a PayPal payment system, accurate room availability checker, 5 homepage styles, 4 colour schemes, custom widget for testimonials and many more. Check out this hotel WordPress theme and give your business a major boost! Anchor Inn is well-known for its elegant design and flexibility. 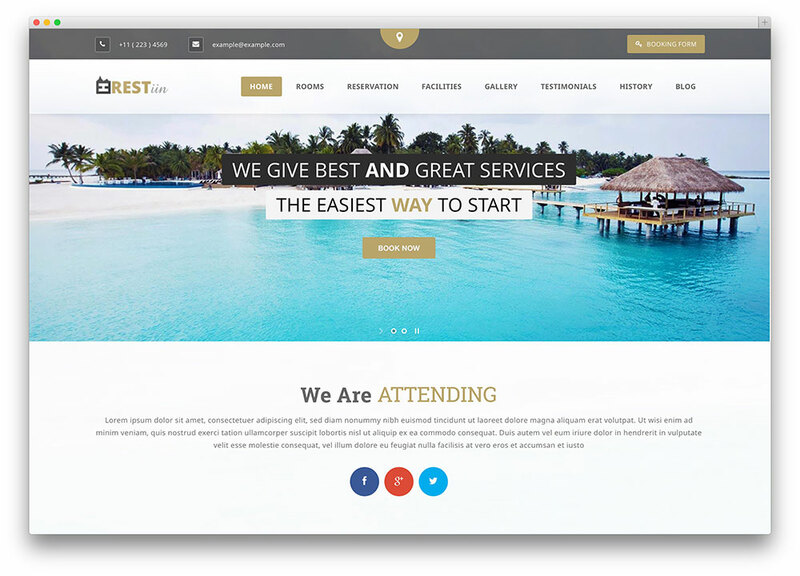 This theme is equipped with the most functional features that make up a professional hotel and resort website. It does not only display a stunning appearance, but it is also absolutely responsive to any kind of devices. Anchor inn is retina ready and provides infinite color variations. You can select a color palette of your choice with its customizable theme options. Other fundamental elements of the website such as typography, background images, logo and other features can be tweaked without dealing with a single line of code. With Anchor Inn’s user-friendly booking system and vibrant design, you will definitely boost your reputation and profits, too. HotelEngine is a sassy theme for hotels. 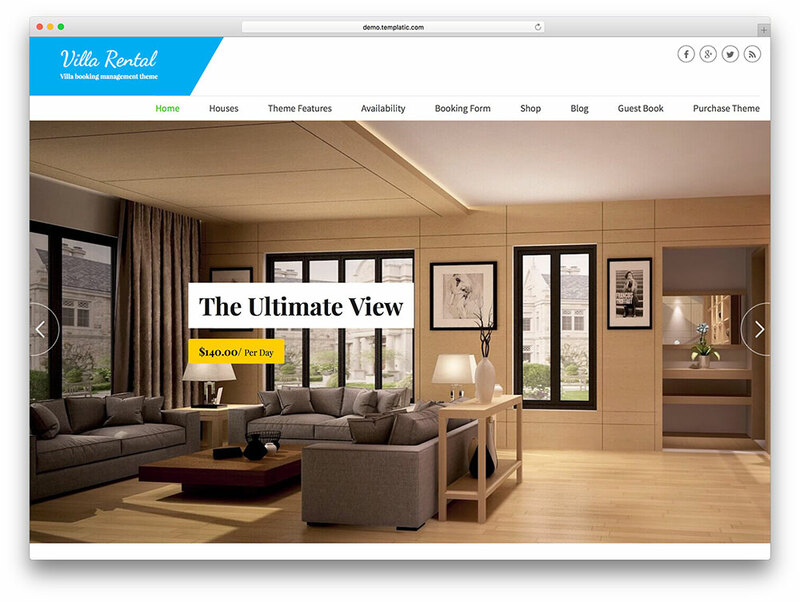 It boasts its sleek yet responsive design perfect for room rental and reservation theme. It comes with the nicest features like built in booking form, full-screen hero image on the home page to showcase your business and other theme customization options. Its built-in slider plugin allows you to create engaging presentation of your home pages, posts and of course your homepage. It also features a drag and drop page builder to help you create your preferred layout design. 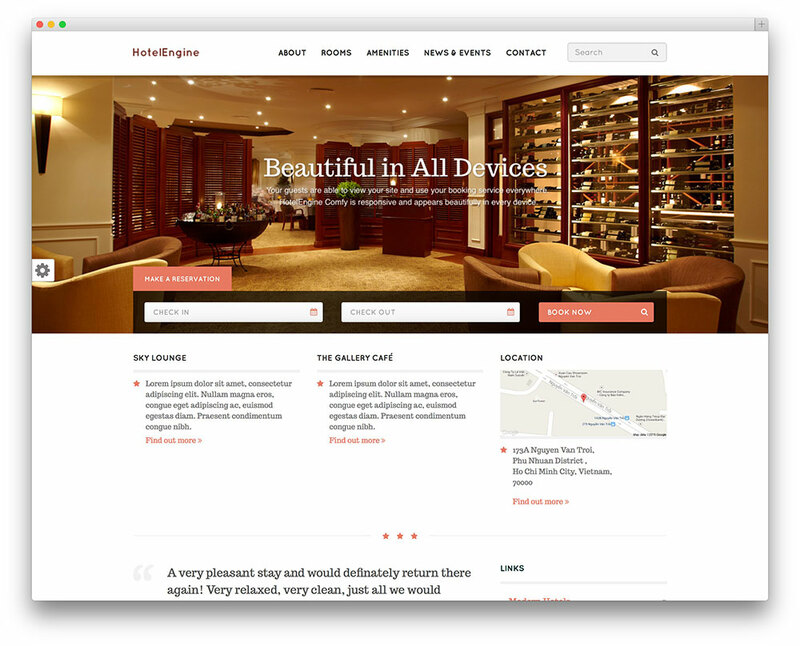 HotelEngine Classy theme has organized and modern designs that are mobile friendly. Avada is a fresh faced, aesthetically minimalist, clean and fast loading WordPress responsive multi purpose theme, suited for the needs of a multitude of business, corporate and personal needs and interests, but particularly well suited for the needs of hotels, motels, resorts and spas of all kinds, offering unique solutions for websites that need to offer clients information, visual content and a general atmosphere that is relaxing, inviting and generally congruous with the image hospitality related businesses aspire to project. Avada offers an intuitive, easy page building plugin that will have you churning out customized pages within minutes, entirely personalized and branded with endless design choices. The templates included will assist in making an elegant, sober looking website that is both clean and cozy to every visitor. A smoothly animated menu lets users navigate your website easily, with multiple header, sidebar and footer options and widgets available for any additional needs. Scalable and responsive, Avada looks just as neat on a small phone as it does on a big screen TV. CSS3 and HTML5 technologies provide delightful, subtle animations, hovering effects and interactivity on a whole other level. 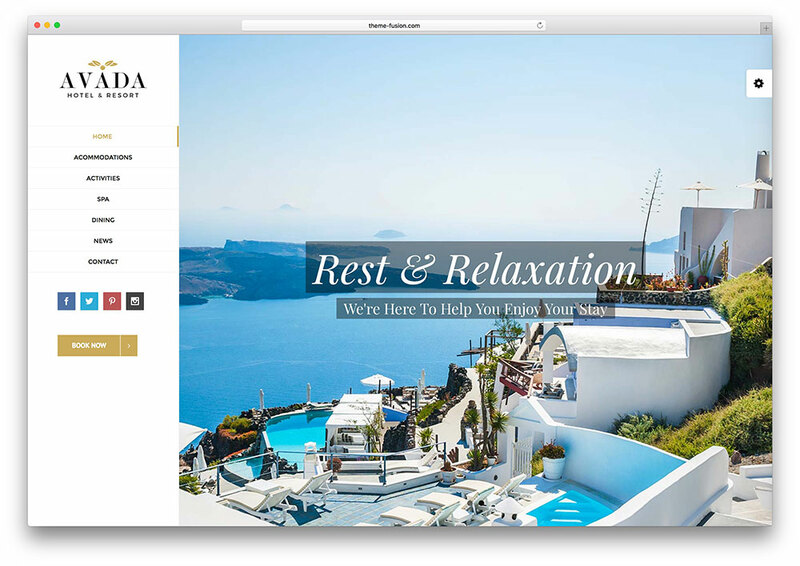 Avada is Retina ready and packed full of icon fonts and custom icons, social media integration, pricing guide templates and widgets, and many more tools to empower your hospitality industry website to unforeseen limits. Villa Rental WordPress theme is an ideal solution for rental property owners or managers who wants to make money by renting out vacation homes. This theme well-built to cater the needs of home owners who want to showcase or advertise their home(s) for rent. Each element of this theme is crafted to appear elegant and professional. With its online booking feature, you can now approve or reject any booking requests submitted by visitors. With Villa Rental WordPress theme rental property owners do not have to hire a real estate agent to get their properties rented and generate ROI. Developing and customizing this theme is very easy because it is completely widgetized. Add, organize and rearrange certain theme elements using the theme’s drag and drop functionality to achieve the look that you want for your website. You can also customize the booking form, include the fields that you want in the front-end of the booking form. The theme also allows you to conveniently add other services in your website and enter different prices and “minimum stay” values for different dates of the year. With its WPML support, you are able to create a multilingual website where visitors can change the default language of their preference. Villa Rental comes with extensive booking calendar that allows visitors to see which dates are taken and which are available. The included coupon module enables you to offer discounts on your regular booking rates. Lastly, you can start a blog in your website with this theme and add new posts about your rental home or industry. 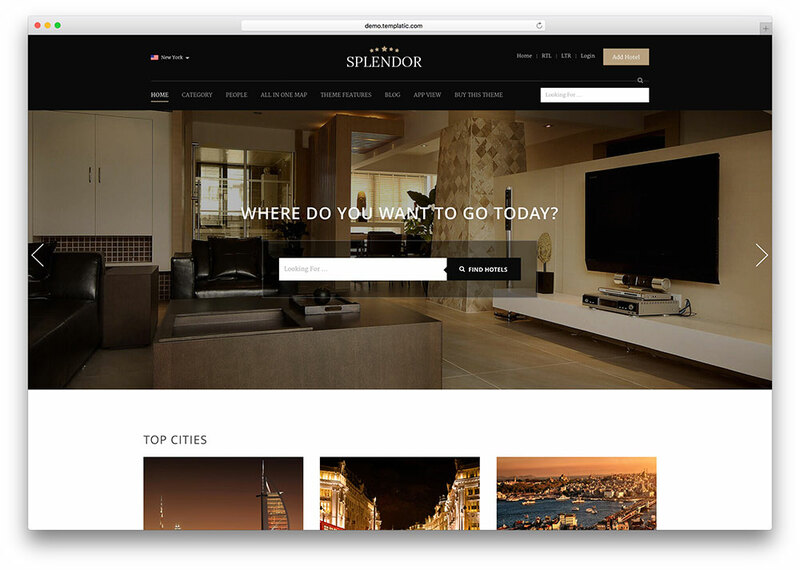 If your goal is to create an impressive Hotel Website, be sure to check out Splendor. This modern and well-designed WordPress theme has many niche-specific features, and a stunning layout that refuses to be mediocre. Splendor has incorporated an online map into its home page. The benefits are obvious, given that clients will have an easier time when trying to reach their destination. In addition, the map will be searchable. Stylish sliders can greatly improve your page’s aesthetic appeal. They can easily showcase gorgeous hotel images, along with personalized listings. If your hotel site promotes multiple establishments, a distinct banner can be added for each city. This helps users to differentiate between different locations, and brings a certain amount of charm to the page. A category page is available, and it has 3 unique layout variations: map view, list view and grid view. It is possible to toggle between them at any time. Site owners can introduce personalized fields for registration and profile pages. Thanks to the owner’s dashboard, it is possible to upgrade, edit or delete any submission. Of course, your hotel site will incorporate an advanced search function with customizable criteria. It should also be mentioned that the theme layout is completely responsive, capable of showcasing all posts on hand-held device screens. 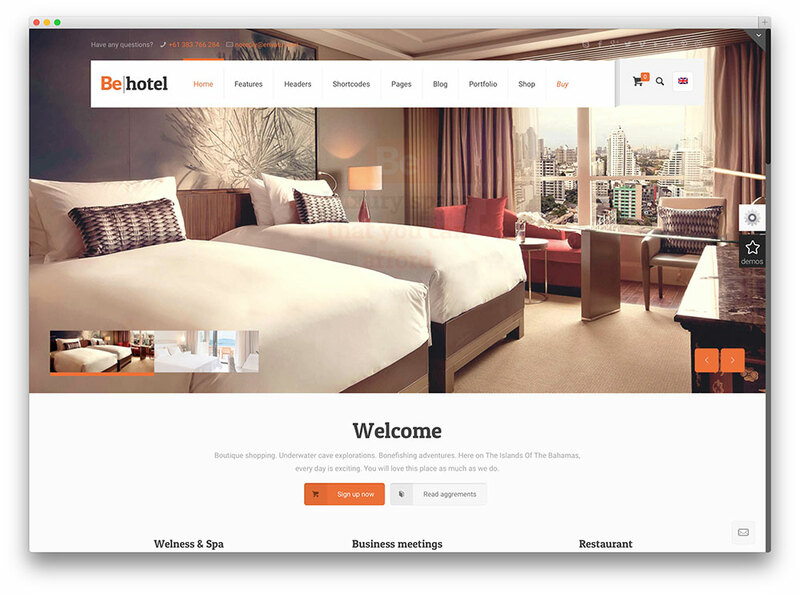 BeTheme is the next big thing in hotel WordPress Theme! It looks beautiful and classic perfect for any kind of website. It comes with clean code and handy user control panel. It offers over 200 short codes and drag and drop page builder for easy customization. It comes with a fantastic Revolution Slider, WooCommerce plugin support and built-in translator for multilingual websites. Moreover, BeTheme also has a fully responsive and retina-ready design that makes your website accessible to any kind of modern devices. Captivate your prospective guests with HotelMotel’s stylish and chic design. This WordPress theme offers a flat design perfect for hotels, motels, resorts and other kinds of businesses that require an automated booking system. It is fully responsive and designed to work flawlessly on any mobile device. It includes powerful shortcode system and other functional options that allow you to adjust your website according to your business needs. Nice Hotel theme exudes elegance and luxury. This fabulous WordPress theme is built for hotels, resorts, villas and other types of accommodation. It offers cool image sliders, automated booking system and event management dashboard and useful accommodation management tools. It has a fully customizable design that allows you to create a unique website without writing complicated codes. What’s more? Nice Hotel theme is translation and multi-lingual ready to take your business globally. 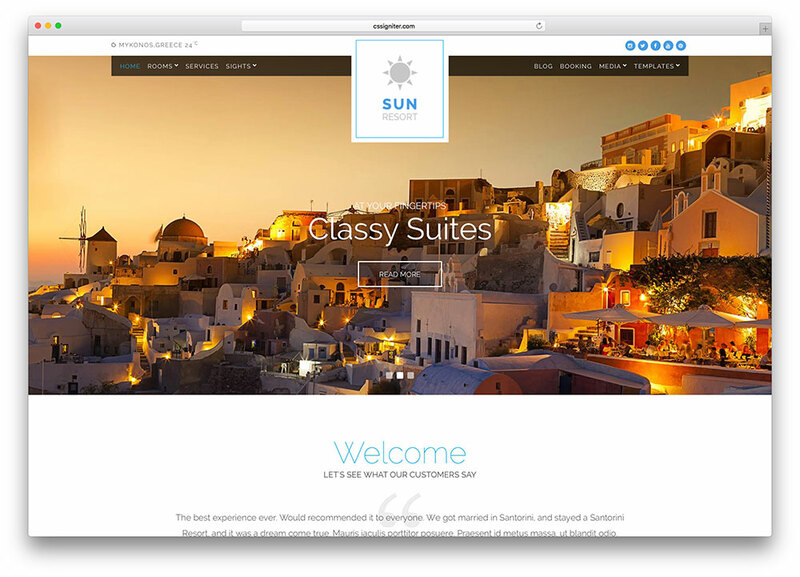 Sun Resort is a WordPress theme aimed at resorts and hotels to showcase a glorious holiday. It is cinematic in effect but intuitional in ease of use. Its flexible layout is so versatile it enables you to quickly and easily set up your website how you want it with a variety of features that can showcase the best of your business. You don’t have to be a tech head to use its layout with ease to create your unique website that works well on computers or mobiles. Its custom widgets mean you can use it with any software platforms such as social networking sites. It is Search Engine Optimized to help you rank higher in search engine lists. Its multiple colour schemes enable you to make your site just how you want it. 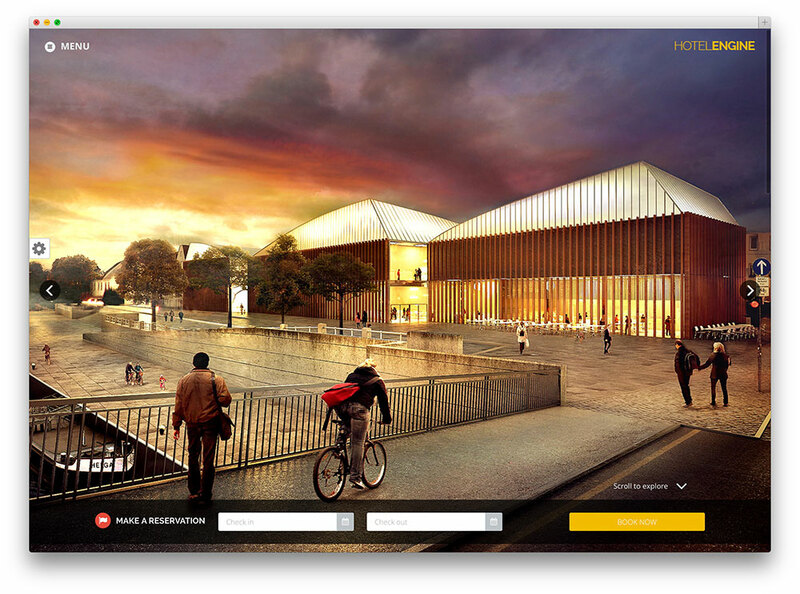 It includes a booking form that enables visitors to get in touch and ask questions. Sun Resort’s professional look coupled with what it enables you to showcase of your destination will wow potential customers. Its limitless domain usage and easy to use options make it ideal for companies who want to present their hotel or resort to the maximum with minimal effort on their part. RoyalGold offers a modern and immaculate WordPress theme especially tailored for hotels, resorts and restaurants. 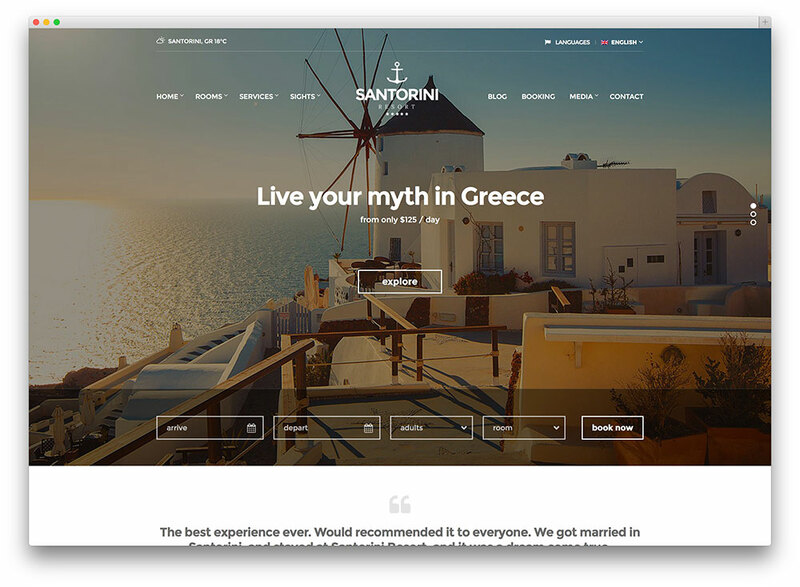 This is a versatile WordPress theme with full-scale image slider to boast your travel destination or highlight other aspects of your business. This theme is fully responsive and designed to work suitably on different devices. Developers made sure that it is optimized for high resolution retina displays. It includes a profusion of customization options that will help you create a professional website. 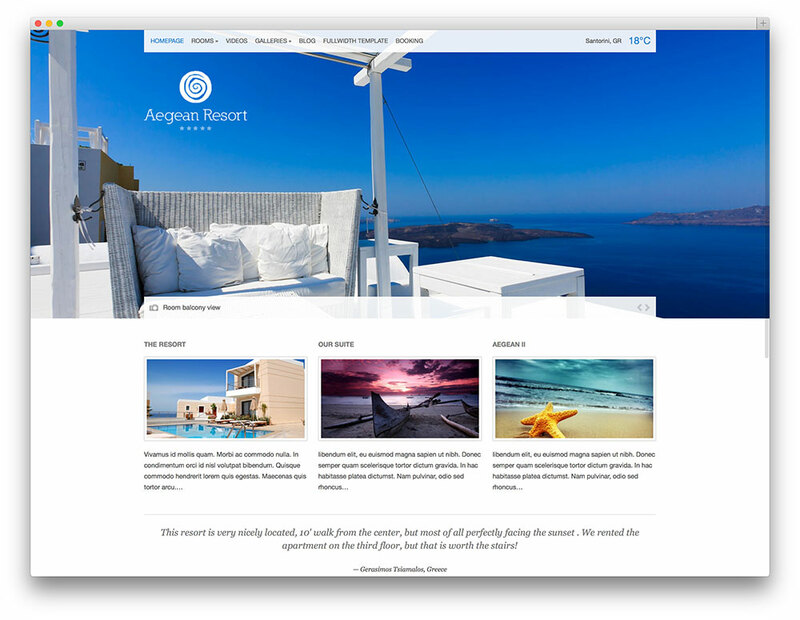 Impress your target customers with the help of Aegean Resort WordPress theme! This theme provides a clean and well-designed layout that is perfect for hotel and restaurant websites. It is jam-packed with incredible features to help you promote a good image on the web. Its full-width background photo slider allows you to display fascinating photos to attract potential customers. 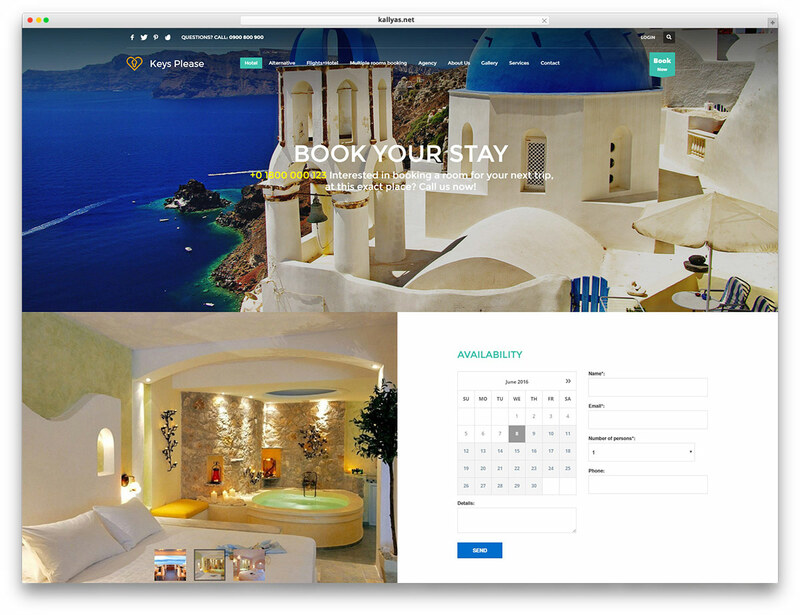 Apart from its trendy design, Aegean Resort Theme boast its advanced template and feature options, systematic booking form, useful shortcodes, color customization options, built-in photo galleries and other cutting-edge website tools to make your life easy. Travelers on the go could access your website on any device because of its mobile responsive design. 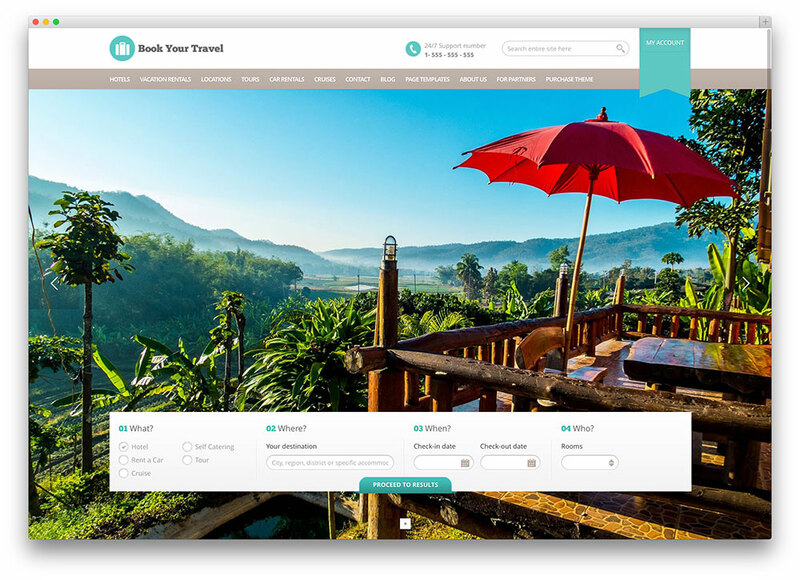 Book Your Travel WordPress Theme looks clean and modern. Its responsive layout design assures that your website will work efficiently on any device. This theme is designed with SEO in mind to boost your web presence. It includes functional tools that help you create your own booking system without employing skilled developers. Book Your Travel is translation and multi-lingual ready. 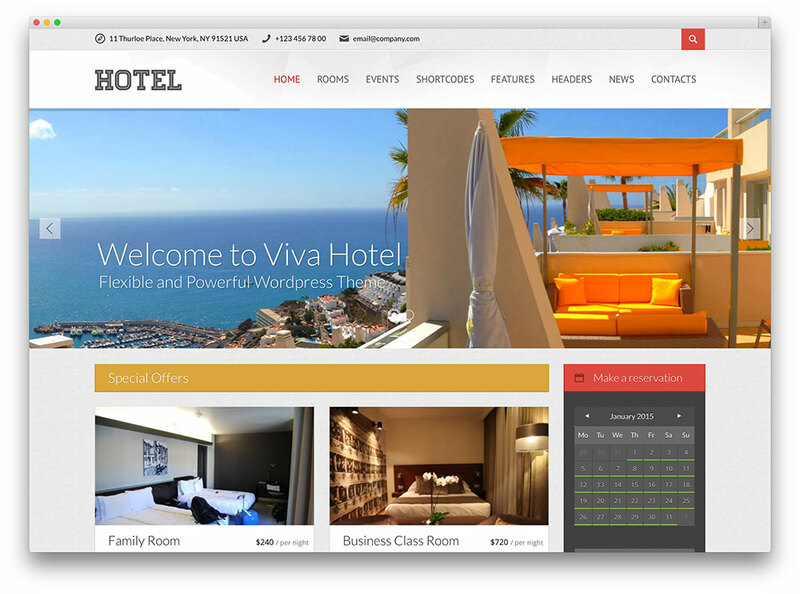 Viva hotel is a simple yet powerful WordPress theme for hotel and travel websites. Since it is not bombarded with unnecessary adornments, it suitably features the highlights of your hotel. Developers did an incredible job with this theme by providing fully responsive layout, listing page builder, retina ready graphics and social network integration. Moreover, it offers custom page templates to showcase your rooms and events, a reservation booking form, sophisticated options panel and other practical tools for a hotel website. Viva hotel’s simplicity will surely help you attract a lot of customers! Hotel Comfy is a one stop solution for all your rental and room accommodation business’ needs. This theme possesses all the amazing features that any hospitality based site would require. To start with, it has a striking homepage that will make your hotel website standout from the crowd. It built-in slider revolution feature will help you create marvelous homepage slider. In addition, the room posts include all the information guests are looking for such as rates, descriptions and amenities lists. Hotel Engine Comfy also comes with an automated booking form to help your guests in booking and reservations. Santorini Resort theme conveys sophistication and elegance. This WordPress theme is designed to cater the needs of hotel and resort websites. It provides a responsive and retina ready design in order to work properly on all computers, tablets and mobile phones. Some of the other key features of this theme include: dynamic weather reporting, rooms templates, photo galleries, customized widget for attractions, testimonials, progressive options panel, booking inquiries form and option to integrate your favourite booking system and customisation options, 8 colour schemes, shortcodes, HTML5 / CSS3 code and more. Nation Hotel is a brilliant choice for hotel and other hospitality business websites. This is designed using the newest HTML5 and CSS3 technology makes your website cross browser compatible. Nation Hotel includes all the tools and functionalities that you need to build a well-designed hotel website. This theme includes: built-in reservation system, user-friendly reservation page and Revolution Slider to showcase your hotel and services.